Through the arts, Mr. Hori was able to feed his fascination with things he witnessed as a child, such as the occult, practices, and concepts of various religions, sciences, engineering, and history with equal intensity. And as a curator, this combination of subjects strongly resonates with his approach. With work experience at Singapore Art Museum and National Heritage Board, what did you bring to the table when you moved to Paris to take on the coveted role of Deputy Director of Artistic Programming at Palais de Tokyo? Many thought that the Palais invited me because of my network with Southeast Asian artists, but that was not the case. While there, I worked mainly with non-Asian artists and supervised the seasoned French curatorial, public programs, and editorial teams. I worked alongside Jean de Loisy, the legendary French curator and President of Palais de Tokyo. Being given the place and honor to work with an amazing team begs one to wonder, “What else can one bring to the table?” I was told by Jean that I was “chosen” because of how unassuming I was in my relations with artists, my tendency to curate by intuition, that I have a knack for the unorthodox, the ability to spot and convert underrated talents, all while operating within the challenges of bureaucratic frames. While there, were you intimidated at all? What did you learn during that time that you brought back to Singapore? I learnt early not to give blind respect to people and institutions of power. This became a part of my personal ethos and modus operandi for work. In France, they love good arguments at the table, all in the spirit of professional discourse to draw the best out of us. You are encouraged to dream the unlikely, defend what you believe, and are given constant support and freedom to realize your vision. Coming home, I brought with me the experience of professionalism at a very high level. Working and spending time amongst the world’s best made me realize how insular we can get here and how we often lull in the mirage of ‘world-class excellence’ without having actually experienced it first-hand. After a wealth of experience at public institutions, what made you want to take up a role at a private gallery? I was actually asked to consider a major role with a public institution when I returned, but for various reasons, that didn’t work. Given that I have worked as an artist, with artist collectives, artist-run initiatives, and public institutions, but never in a small, private gallery setting, this new frame of work became something I was curious about. I never imagined that the small private gallery I chose to start working with would soon carry my name. Just a few months ago, I was voted as President of the Art Gallery Association of Singapore (AGAS). To me, these are marks of faith and both come with a plethora of responsibilities. I am answerable for my actions to colleagues, peers, patrons, and artists that I work with. Every project is challenging, as resources are limited. Private galleries are an equally important part of the thrust that supports the development and sustainability of artists and patrons, yet not much credit has been given. Would you say that the role of the curator has changed? How different is it now compared to when you first started? When I started, the role of the curator was reserved for those working within institutions. The rest of us were referred to as ‘organizers’ and mostly operated without the professional training required. We learnt everything – from project management, fund raising, and marketing – through hands-on experience, fueled by a deep-seated desire to make things happen and contribute to make a difference. My first 15 years upon graduating from art school was filled with uncertainties, with very little opportunities for full-time work at art institutions — unlike today. These days, I meet many young people who are specially trained in curating at prestigious schools overseas, returning to a buffet of support structures. Yet, the fire seems lacking. There appears to be an adversity to adventure and risk taking these days. In your opinion, what is the current state of Singapore art? What is driving it forward or holding it back? The advent of social media appears to have led to a demand for an art environment filled with the spectacular. So much resources have been expended in bringing the public to art, but the intrinsic quality of art produced, and the programing of art-related events here have not been very consequential to the public’s literacy of what art is and could be. While the state incessantly commits to the development of the arts, it also needs to find some time to be brave, honest, and reflect on the impact and sustainability of what it has committed our professionals and our audiences to. We should consider the youthfulness of our state and contemporary society not as a handicap, but a good reason for us to be courageous and original in what we do. What are some challenges Singaporean artists face, particularly the younger ones? What can be done? 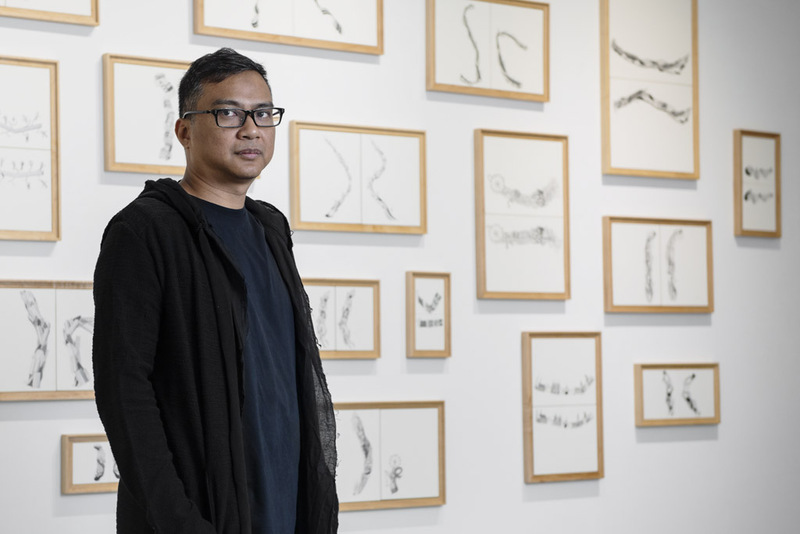 The pressure of operating from an expensive city like Singapore can be crippling, but young artists should persevere, take time, and stay committed for the maturity of their practice. A big part of making great art is to live our lives to the fullest, to make voyages, and gather new experiences. The acquisition of real-world knowledge and skills adds meaningful layers to an artist’s practice. In my own journey, I have worked as shipyard labor crew, a futures trader, graphic designer, landscape designer, and best of all, as a store artist at the now defunct Tower Records. These divergent experiences inform part of my worldview and taught me how to negotiate with the myriad characters I encounter. What are you looking forward to in Singapore’s art calendar? Perhaps in the next few months or next year? Aside from the never-ending excitement at Chan + Hori Contemporary, I am definitely looking forward to the next edition of the Singapore Biennale at the end of next year.